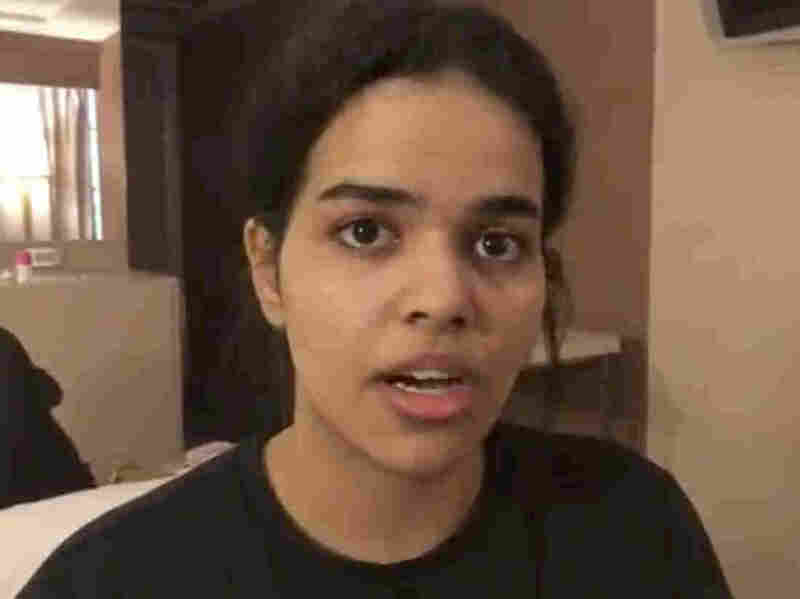 Saudi Woman Seeks Asylum, Fears Family Will Kill Her, OK To Stay In Thailand For Now Rahaf Mohammed Alqunun's real-time Twitter pleas for help went viral as she begged for refugee status. Thai officials have let her talk to U.N. refugee officials. In this image made from video, Rahaf Mohammed Alqunun sat barricaded in a hotel room at an international airport in Bangkok. Alqunun asked for asylum in Australia, and Thai officials said they won't deport her for now. The news came in a rapidly developing story highlighting the plight of women in Saudi Arabia, the rights of refugees to seek asylum, delicate relations between nations and international pressure brought to bear on transit countries via social media. Alqunun has been granted temporary entry into Thailand under the protection of the U.N. refugee agency which is expected to take between five to seven days to evaluate her claim for asylum in Australia. Earlier in the day, Alqunun's father arrived in Thailand, setting off concerns that she might be forced to return to Saudi Arabia. "My father just arrived," she said in an update on Monday, adding that it "worried and scared me a lot." Thai officials had arranged for Alqunun to be on a flight out of Bangkok on Monday, but she refused to leave her airport hotel room before she spoke to someone from the U.N. Refugee Agency, the office of the United Nations High Commissioner for Refugees. Repeating her desire to leave Thailand for another country where she can seek asylum, Alqunun said, "But at least I feel [safe] now under UNHCR protection with the agreement of Thailand authorities. And I finally got my passport back." Alqunun was stopped at the Thai airport Saturday night as she attempted to travel to Australia, where she had planned to seek asylum. With that avenue closed and fearing what might come next if she were forced to return to her family, she took to social media while holed up in an airport transit hotel room. "I'm in real danger," Alqunun said in a Twitter account that sprang into existence over the weekend, posting anguished pleas to anyone who would listen. "I am real, I exist, I am still breathing, but I am not sure I can continue or that I can stay alive unless the Saudi embassy stops pursuing me," she wrote. Her appeals have attracted tens of thousands of followers. The Saudi national said she was seeking asylum in any Western country that would have her. Human rights groups and Western embassies implored the Thai government not to return the woman to Saudi Arabia. A group of Thai lawyers filed an injunction to prevent her from being deported back to Saudi Arabia, Phil Robertson, deputy director of Human Rights Watch's Asia division, tells NPR. Now, authorities in Thailand have reversed their earlier position and called off the deportation, Michael Sullivan reports for NPR. "The head of Thailand's immigration police told reporters she would not be returned against her will," Sullivan says. "Supporters hope she'll be given her passport back and allowed to continue her journey to Australia." Alqunun had been on vacation with her family in Kuwait last week, when she slipped away and boarded a plane to Bangkok. Her family was abusive, especially since she had renounced Islam, she told the BBC. Her plan was to fly through Thailand to Australia. But while she was in the Thai airport, she said security officials stopped her, claiming her family had filed a missing person report. Alqunun said they took her passport and forced her to come with them. They took her to a hotel room to await a flight back to Kuwait and then Saudi Arabia "by FORCE," she wrote. But while in the hotel room, Alqunun barricaded herself in and posted a video to social media. "I'm not leaving my room until I see UNHCR," she said. "I want asylum." On Monday morning, a team from the U.N. arrived and was permitted to interview Alqunun, according to her Twitter account. "They gave their word that she would remain in their custody & that she is now safe." Officials had been trying to send Alqunun back to Kuwait City on an 11:15 a.m. flight, but because she refused to leave her hotel room, the flight left without her. Alqunun's father is a senior government official in the Saudi government, Robertson said. "And so if she's sent back to Kuwait, it's basically the same as sending her back to Saudi," he said. "They will just grab her and take her across the border very quickly." Alqunun told Reuters she was seeking refugee status because of "physical, emotional and verbal abuse and being imprisoned inside the house for months. They threaten to kill me and prevent me from continuing my education. They won't let me drive or travel. I am oppressed. I love life and work and I am very ambitious but my family is preventing me from living." Thai authorities say they weren't acting at the request of the Saudi government when they detained Alqunun. She was denied entry because she lacked a hotel reservation or paid return ticket, Thai immigration chief Surachate Hakparn told Reuters. "The Thai government is playing games, and is frankly playing footsie, with the Saudi government," Robertson told NPR earlier in the day. Saudi Arabia is denying that their people were at the airport, Robertson said. "Saudi Arabia is lying through their teeth on this one." But the international support for Alqunun appears to have persuaded Thai officials allow the U.N refugee agency some time to help her. "As of now, she does not wish to go back and we will not force her. She won't be sent anywhere tonight," Surachate said at a news conference according to the Associated Press. Alqunun is "incredibly courageous and brave, and she's exhausted, but she is prepared to fight to the end," Robertson said. "And we're prepared to help her any way we can."